This object is the first book printed in Ireland and, as such, marks the island’s rather belated acquisition of one of the defining features of modernity. The revolutionary process of printing on a press with moveable type had been pioneered by Johannes Gutenberg in Germany almost exactly a century earlier. The delay in catching up with this new technology says much about Ireland’s absence from the mainstream of the Renaissance, but if the advent of the first printed book brings a key aspect of modernity to Ireland, that modernity arrives in a form that is unwelcome to a substantial majority of the population. Much of the initial impetus for the use of print was political and administrative, but it became an important weapon in the struggles between the energetic new Protestant faiths and the Catholic Counter-Reformation. The first uses of print in Ireland came in the wake of a failed rebellion against the crown by Silken Thomas FitzGerald, when the Tudor monarchy set about building an effective permanent government in Ireland. Printed royal orders were sent from London, as were printed copies of the submission to the crown of the powerful chieftain Con O’Neill. Print, therefore, arrived as an aspect of official power and propaganda. Its effectiveness was limited in part by the limited knowledge of the English language in Ireland and in part by the absence of a resident printer. This latter problem was addressed in 1550 when the privy council granted £20 to establish Humphrey Powell, a London printer, in his trade in Dublin. His first task was to produce what the title page calls ‘The boke of common praier and administration of the sacraments…after the vse of the churche of England’. That Church of England was, of course, itself a momentous development for Ireland. The product of Henry VIII’s split from Roman Catholicism in the 1530s and the establishment of a national church headed by the monarch. 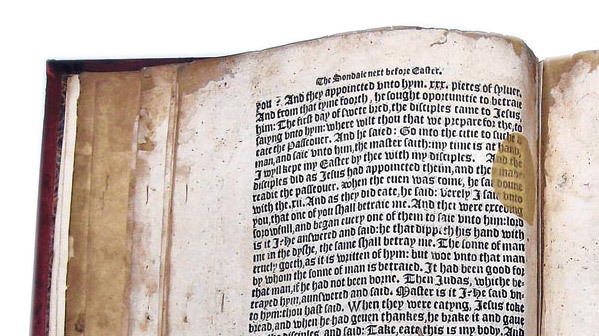 The Book of Common Prayer, produced in 1549 under Henry’s short-lived son Edward VI, was a major step towards the creation of an official and uniform Protestant religion. It was temporarily reversed under Edward’s Catholic successor Mary, before being copperfastened under Elizabeth I. The relative failure of the Protestant Reformation in Ireland is one of the great shaping forces of modern Irish history. Who knows how the island would have developed had the Book of Common Prayer eventually become as common and comfortable a presence in the average Irish home as it was in England? That this did not happen made Ireland one of the great exceptions to the compromise formula adopted throughout most of Europe after ferocious religious conflict: cuius regio, eius religio: the religion of the ruler will be the religion of his subjects. In Ireland a majority of those from both Gaelic and Anglo-Norman stock remained Catholic.